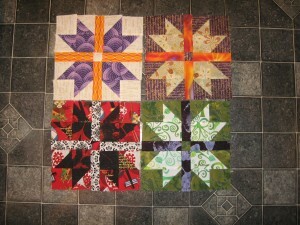 Here are four more blocks, bringing my total for the month to 9. Interesting thing about the lower left block (which I may replace if I have time) – when the fabrics were pulled, there was a lot more contrast between the dark and the middle colours. I think this is because the dark read as black with a bit of red when you saw it in a large piece, but cut up small like this, you really see the red in it. Anyway, it’s not my favourite block due to the contrast issues, so I do hope to have time to replace it. Feel free to count my blocks as only 8 if you think there’s not enough contrast, Sophie.